Padel is considered a hybrid, scaled-down version of tennis and squash. It has gained rapid acceptance due to its simplicity and similarities to other popular racquet sports. The racquet is solid, being made mostly from light composite materials. The surface is perforated to lighten the racquet and to allow for airflow. The face of the racquet is relatively large measuring 26cm X 29cm (10in x 12in) and the overall length is 45cm (18in). The short racquet is much easier to control than a longer stringed racquet. In this way, from the first time on court, novices of all ages and racquet skills can enjoy a well-paced game with plenty of rallies. The game of padel is always a doubles game using mainly tennis rules and scoring, with some key adaptations such as an underhand serve. The game is played in an enclosed structure and the rules allow for the use of the back wall and sidewalls resulting in longer rallies. The court is rectangular in shape with a dimension of 10m wide x 20m long, and is divided in the middle by a net. 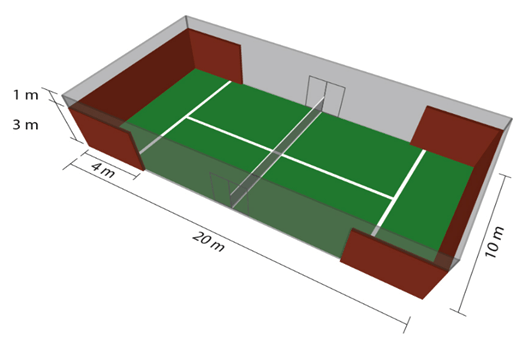 At the end of each court, there is a half box-shaped wall consisting of 10m wide back wall with two side walls of 4m extending along the sidelines. Not to be confused with platform tennis, where the court is smaller and has sidelines and a different heavier ball is used. Come to one of our open play days. Even if you’ve never played padel before, or if you’ve tried to play tennis, or other racket sports and failed miserably, you’ll discover that padel is for you!